The same old boilerplate: From time to time the nice people at Lenovo send me a gadget. They’re handy to have around – both for my own use and when trying to help out in the Lenovo forums. I do some testing and writing as well. I’m not otherwise compensated, and opinions are my own. I DO NOT speak for Lenovo. You’d think the humble mouse was fully evolved by now. Nope. Lenovo has managed to find ways to refine even the venerable rodent. 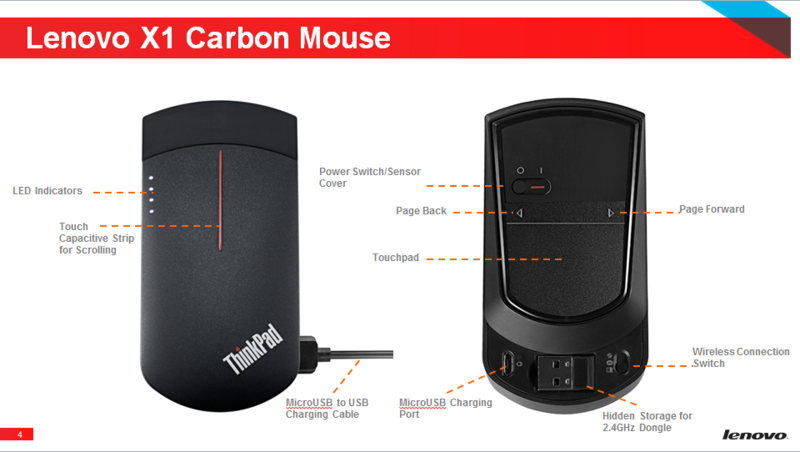 Behold the ThinkPad X1 Wireless Touch Mouse. It’s a highly capable and innovative gadget. The “buttons” are touch-sensitive, with the actual “click” located on the bottom. It’s also quite compact. Perhaps a little too compact for all-day use on the desk in my big paws, but an excellent companion to my ThinkPad X1 Yoga on the road. Maybe an even better companion to the TrackPoint-absent non-Think Yoga series like my 900 where a small external mouse really makes a difference. Please note that the X1 mouse supports Bluetooth 4.0 and won’t work with older laptops like my ThinkPad T420 that use an earlier Bluetooth version. For those cases use the mouse in RF mode with the included USB dongle. Note: discount code currently for North American customers only.